A 50th Anniversary only happens once and this tee shirt is bound to go fast. 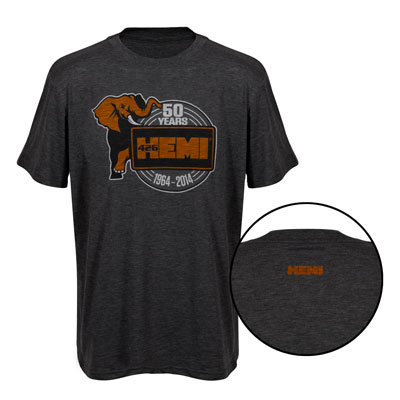 Specially made to commemorate the 50th Anniversary of the Hemi 426, this tee shirt includes the unique Anniversary logo on the front and the HEMI script logo on the back. Bound to spark many HEMI memories, this will make a great gift for any Mopar fan! Made of 65% polyester/35% cotton. Sizes: M-2XL. Available in Charcoal. 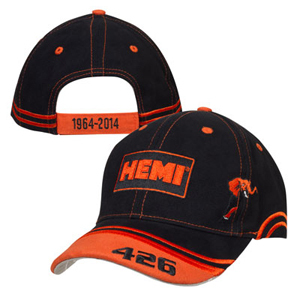 This two-tone color HEMI cap is loaded with great features and honors the long history of the incredible Hemi 426. Made of 100% brushed cotton twill, it features a six panel crown with custom taping underneath, structured style, contrast stitching, stripe detail, two-tone bill, contrast under-bill with screen print, Velcro back closure with embroidered anniversary years, all while tastefully decorated with the HEMI 50th Anniversary logos. This cap is bound to be a collectible item, so order one to wear and one to keep! One Size Fits Most. Available in Black/Orange. 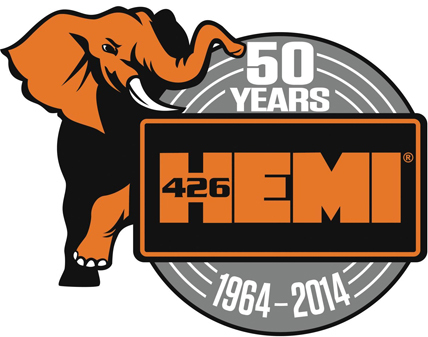 This clock celebrates the first 50 years of the HEMI® 426 engine. When your friends ask what time it is, you can answer, "Time to get a HEMI®"! Certainly if you are a fan, or if you own a HEMI®, you will want to park one of these clocks in your garage or den. With white lettering and a yellow band of neon around the clock face, it highlights the 50th Anniversary of the debut of the HEMI® 426 engine in 1964. 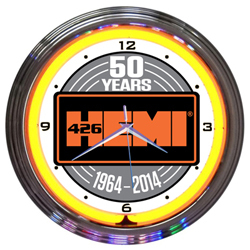 This memorable clock will appeal to all generations of HEMI® fans. Get one today! Size: 15" dia.